These strong flavoredmint parathas are easy to make and would make a wholesome meal option for your family. These flavorful parathas can be served with curd or pickle and can also be taken for long trips. 1. Combine all the ingredients in a deep bowl and knead into soft dough using enough warm water. 2. Divide the dough into 6 equal portions. 3. Roll a portion into a 5" diameter circle using whole wheat flour for rolling and grease it evenly using little oil. 4. Fold the 2 opposite corners of the roti towards the centre, without overlapping them. Now fold the other 2 opposite corners similarly to make a square envelope. 5. 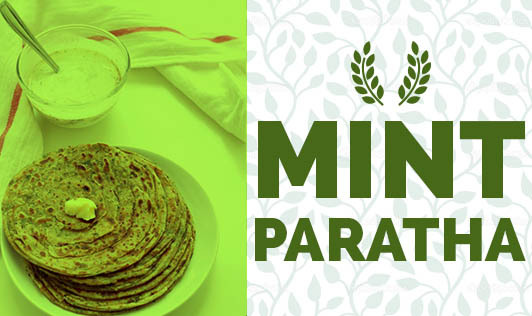 Sprinkle 1 tbsp of mint leaves evenly over the envelope and press it lightly so the mint sticks to the paratha. 6. Heat a non-stick tava (girddle) and cook the paratha using a little oil till it turns golden brown in colour from both the sides. 7. Repeat steps 3 to 6 to make 5 more parathas. 8. Serve hot with fresh curds and pickle.